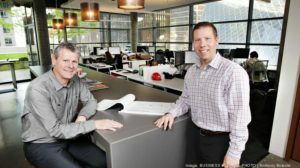 Founder George Schuchart (left) and his son Casey Schuchart have guided their construction company through the ups downs of Seattle’s building cycles by tending to relationships with firms, such as Boeing and Microsoft. George Schuchart has had a handful of 2 a.m. moments over the years. They’re bound to happen when you’re the head of a construction company in boom-and-bust Seattle, where one year you can’t find enough heads for all the hard hats you have to fill, and the next you’re wondering how you’ll keep all those folks employed. Schuchart and his eponymously named company have gotten through by tending to relationships with clients, such as Boeing and Microsoft, employing the right people and making them feel at home. “I think this is a very safe place to work. The word that comes up all the time is family,” said Schuchart, who has an open-door policy for employees. Schuchart is a fifth-generation company with a story that reaches back to 1855, when Washington was still a territory. George Schuchart’s great-grandfather, cabinet-maker Howard S. Wright, started a construction company that went on to build some landmark projects, including Grand Coulee Dam and the Space Needle. George Schuchart worked for Wright Schuchart – then the parent company of Howard S. Wright Construction – before the company was sold in 1987. At Wright Schuchart, he worked on pulp and paper mill projects, and planned to build his new company in Everett on that foundation. In 1988, he went out on his own and started Schuchart. His timing could not have been worse as mills started cutting back operations and eventually shut down. Schuchart landed work for Boeing and has gone on to build some high-profile projects, including the Bullitt Center, which is the world’s greenest office building; the Microsoft Cybercrime Center; and the Chihuly Garden and Glass. The Bullitt Foundation brought Schuchart in early on in the project to give preliminary pricing estimates. Soon the company had the contract. No building like the Bullitt Center, which collects and generates more water and electricity than it uses, had ever been built. “Schuchart rose enthusiastically to the challenge, and they delivered,” said Denis Hayes, president and CEO of the Bullitt Foundation, a nonprofit that promotes protecting the environment. Schuchart representatives attended weekly design meetings for more than a year before building began to ensure there would not be problems in the middle of construction. In addition to ground-up construction, the company does tenant-improvement work, and industrial work, primarily for Boeing. Schuchart’s revenue has grown 7 percent in the last five years and 15 percent in the last 10 years. The company has gone from 70 employees in 2011 to 105 today. As president, George Schuchart, 65, still leads the company and expects to do so for a long time. But he is turning over some of the more challenging aspects of the business. Know who you’re working for. Take great care in selecting your clients because your shared values will translate to shared success. Live by the golden rule. Treat everyone fairly and equally, whether it is an employee, a subcontractor, a supplier, a client, architect or consultant. It’s a team sport. No deal is better than a bad deal. Know how to say no.